Here is a small but fun experiment that YouTube is rolling out today: videos that let you switch between different camera angles while the video is playing. These multi-angle videos are only an experiment right now and there’s only one video that actually showcases this feature so far. 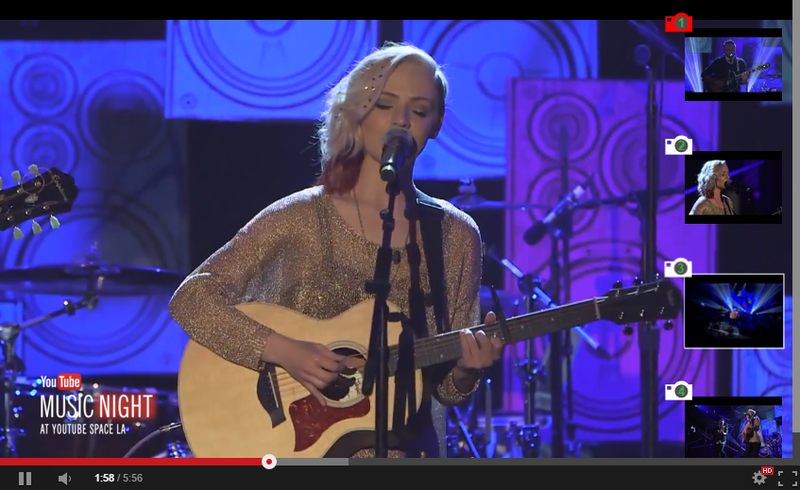 If you want to give this a try, head over to Madilyn Bailey’s YouTube channel — she’s a popular indie artist on YouTube who is probably best known for her cover songs. The YouTube team took her performance at the most recent YouTube Music Night and turned it into a multi-angle video. As YouTube tells me, the process of creating these videos is automatic on the user’s side, but the technology the team developed to support this is not ready to scale to everyone yet. YouTube is not the first video site that is trying this. Over the years, there have been multiple startups that focused on nothing else but developing similar features. And there have been apps like the Marc Cuban- and 500 Startups-backed Switchcam or Streamweaver that focused on crowdsourcing these kind of videos. None of these really took off and Switchcam is now dead. But if there is one video site that can probably make this work, it’s YouTube, simply because of the sheer size of the service’s user base. As a YouTube spokesperson told me, this experiment is part of YouTube’s efforts “to keep making more immersive and interactive video experiences.” Because this is an experiment, though, YouTube is only allowing a few select YouTube users to test the feature. If you want to be considered, you can sign up for access here.